Green Action' silent protest against GMOs - The sign reads: "Our food. Our decision." Thanks to Zelena Akcija (Green Action- Friends of the Earth Croatia) and other organizations, Croatia remains part of a group of the EU member states with stringent national policies against GMOs. Several stringent laws regulating genetically modified organisms (GMOs) in Croatia entered into force despite pressure by the United States of America (US), who threatened Croatia with World Trade Organization (WTO) action in 2001. The fact that Croatia went ahead with its restrictive policies on GMOs should be thanked principally to activities by NGO Green Action (Zelena Akcija)- Friends of the Earth (FoE) Croatia that since this country signed the Cartagena Protocol on Biosafety and ratified the Convention on the Biological Diversity asked for its Government to form a Bioethical Committee and deliver a Law on GMO. A new Croatian law on GMOs came into force during 2005. This law bans the release of GMOs in protected areas including their buffer zones, as well as in areas of organic farming and those important for ecotourism. Additionally, 14 (out of 20) Croatian counties decided to declare themselves GMO-free. The law, however, does not provides labelling threshold, although a separate government regulations set 0.9% for food and 0% for seeds. This means that the Ministry of Health and Social Welfare could change labelling threshold. Green Action have been performing activities and calling on public attention on the changes in the laws on GMOs, particularly in light of Croatia accession to and membership in the European Union (EU). As a result, Croatia remains part of a group of the EU member states with more stringent national policies. For example, in 2009 Green Action pointed on the risk of introduction in the Law of the concept of coexistence, i.e., parallel planting genetically modified, traditional, and organic crops. In 2015, Croatia together with other 16 EU members requested and got approved the exclusion of its territory from the approval of expansion GMOs production to the agricultural bio-technical companies. In 2017, there is raising demand of introducing “GMO-free labels” to the products sold at the Croatian market, as currently consumers in this country and other EU member states cannot be sure that the products they buy does not contain GMOs. Project Details Laws banning GMOs. Croatia remains part of a group of the EU member states with the most stringent national policies against GMOs. Development of Alternatives Croatian NGO Green Action demands for more stringent national GMOs related laws and policies than the EU norm prescribe. Why? Explain briefly. 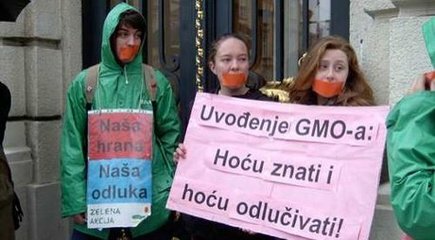 NGO Green Action have been successfully keeping Croatia free from GMO through its action of public awareness raising and lobbying with the national decision-makers and the country's representative in the EU parliament. Hrvatska ne smije podilaziti biotehnološkim lobijima na razini Europske unije! Green Action' silent protest against GMOs The sign reads: "Our food. Our decision."